Drum-roll please… We’re only a couple of weeks away from the 2018 pumpkin season at Kenyon Hall! Across the farm we’re working hard on the final preparations for this year’s season. So before the fun begins and we open the patches to welcome you to the farm during October I wanted to write a few words about all things pumpkins. There’s some hints and tips at the end to reward those who read the whole post! ​From modest beginnings when we planted the first mini patch from the scooped out seeds of a single pumpkin 30 years ago, the pumpkin season has grown to be the busiest time of our year. By a long way! We spend 6 months growing over 15,000 pumpkins in two patches, with pumpkin plants creeping out across 5 acres of land (that’s 5 football pitches). 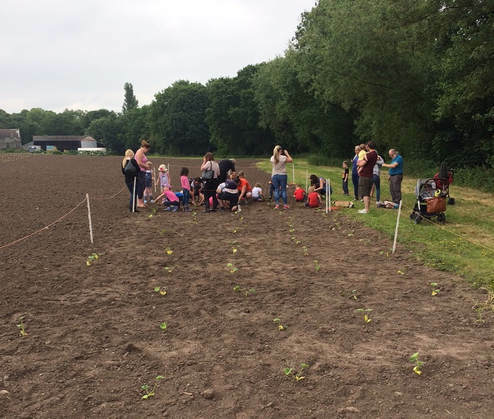 And this year we even enlisted help from our Junior Farmers to help with the planting! Our Junior Farmers helping plant pumpkins in May. How are the pumpkins this year? Although we feared the pumpkins might suffer from the extreme weather of 2018, as many of our other crops have, they’re actually looking very well! The plants have produced a good yield (i.e. there are lots) and although the average size isn’t enormous, it’s very decent. After such a poor summer fruit season it’s great to be able to report some good news about our pumpkins! What can I expect if I come? With good weather and a good crop, the pumpkin patch can be a magical place to visit! However the cutting process shown above helps explain why the pumpkin patches often don’t look quite like the picture postcard you might imagine! By the time October comes, most plants will have started to die away, most pumpkins will have been cut from their stems, and a few pumpkins will have started to rot in the field. But these are just the realities of pumpkin farming and we’re happy to let you see it all for yourself – warts and all. Throw in some wet weather and 1,000s of welly boots and the patches can quickly turn muddy. Even so, most visitors embrace the mud as part of the fun -which child doesn’t love jumping in muddy puddles?! - so as long as you come prepared then you’ll be fine. As well as the pumpkins in the patch, we'll have a similar range of ready picked pumpkins of all shapes, sizes and colours available in our polytunnel. You'll also be able to carve some or all of your pumpkins here at the farm, with lots of examples of different designs on show to inspire you. We'll also have pumpkin-themed merchandise as well as plenty of hot seasonal food available - hog roast, hot dogs, chocolate apples, pumpkin soup and more! As last year, this season will be all about the pumpkins - our maize maze and other fruit/veg picking fields will be closed by the time the pumpkin season starts. With this in mind you should expect to spend an hour or two at the farm this year, rather than a whole day. ​How can I plan the best visit? If you’ve read this far, well done - you’re clearly keen to make the most of your pumpkin visit this year! I’ve written the hints and tips below to try and help you (and us) have the best pumpkin season yet and I’ll be your friend forever if you follow the advice! It’s all about timing… Choosing when to come is probably the biggest decision to get right. The popularity of the pumpkin season has grown every year to the point where on the busiest days our car park will be full by 10am and stay so until mid-afternoon. This year the season will run from 13th-28th October and the very busiest days will be the weekends of 13-14th and 20-21st October. The half term week (22nd-28th October) will also be extremely busy every day, but probably not quite as busy as the weekends. To try and ease congestion we ask you to visit on the quietest days you’re free. If at all possible we’d urge you to visit between 15-19th October. On these days we’ll open til 6pm so after school picking and carving is available. If you can only come on one of the busy days, then it’s best to avoid lunchtime when the crowds are greatest. Come early - we open at 9.30am - or leave it until the lunch rush is over from 3pm onwards. On these days queues are unavoidable so whenever you come please bear with us! Avoid fake news… Without wishing to sound like Donald Trump, we’d implore everyone to check our website for the latest accurate information before your visit. To avoid any mixed messages, we don’t post anything on social media during the season unless there’s an urgent announcement. We don’t create Facebook events. We don’t do media interviews. We just have a single source of information that we can keep 100% accurate and up to date – our website. Come prepared… Even in the driest autumn, pumpkin picking can be a messy business! We’d suggest everyone comes decked out for a trip to the farm – wellies, old clothes and coats. For those intending to visit the café or farm shop it would be great if you could bring a change of footwear. You can’t imagine how much mopping it takes to scrub the floor clean after a muddy day! Finally, this year we’re encouraging everyone to bring their own bags and boxes to carry the pumpkins home. This will reduce the number of plastic bags we need and help us move towards our mission of becoming plastic free! Bring a smile! We’ve spent our summer growing as many pumpkins as we can and we love seeing how happy it makes all the children to come and pick them. 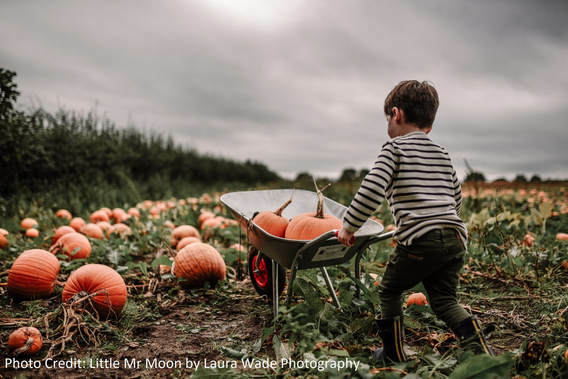 Whatever the weather or the pumpkin patch gives us this year, we’ll do the best we can and know that you’ll all help us make this another amazing pumpkin season. We look forward to seeing you soon!